In one sense, Biden is right. Grand narratives of American decline that emerged after the seemingly unbounded prosperity and youthful enthusiasm of the 1950s have been shown to be false. The economic power of the US did not decline relative to that of the Soviet Union, as the Nobel Prize-winning economist Paul Samuelson predicted in the many editions of his seminal textbook right up to the collapse of the USSR. Neither did American strength decline relative to that of Japan, as Harvard professor Ezra Vogel warned in his Japan as Number One, published in 1979. But Biden is wrong in another way, one closer to his own experience. Claiming that America is in decline – “betting against America” – has long been a popular, but not always successful, route to the White House. In 1976 Gerald Ford’s election campaign ran television advertisements that claimed the president was “making us proud again”. Ronald Reagan’s 1984 re-election campaign declared, “It’s morning again in America.” Now it is 2016 and we have Donald Trump, perhaps the most radical “declinist” yet, who wants to “Make America great again”. It is Americans’ experience of relative decline that in part explains Trump’s popularity. On the issue of decline, Trump is partially right. The Prosperity Index shows that America is in relative decline and, while the picture is not too worrying yet, Trump’s anti-trade, anti-immigration, anti-government plans to reverse that decline will make things worse. It is, in fact, Americans’ experience of relative decline that in part explains Trump’s popularity. We think of a country in decline as one in which living standards are in free fall and where society is collapsing. This kind of decline – absolute decline – is what the Roman Empire went through in its final years. Its population shrank, its infrastructure crumbled, and its territory split into various polities until it was no more. It is true that the median American household has a lower income now than it did in the late 1990s. Adjusted for inflation, it peaked in 1999, dropped to a lower level after the global financial crisis, and has hovered around that same lower level since then. But there is more to living standards than income alone. Americans enjoy better technology, have larger houses and more leisure time, and live longer. Income aside, living standards in the US have improved; the country is not following Rome’s path of absolute decline. Once the “workshop of the world”, Britain experienced a decline in both its economic output and its productivity relative to the emerging industrial powerhouses of Germany and the US. A better analogy for the US today is the British Empire’s relative decline in the late 19th century. Once the “workshop of the world”, Britain experienced a decline in both its economic output and its productivity relative to the emerging industrial powerhouses of Germany and the US. The US economy grew faster and larger than the economies of Britain and Germany, but then its mid- to late-20th-century rivals emerged – the Soviet Union and, after that, Japan. The collapse of the USSR and the bursting of an asset bubble in Japan meant that American prosperity surged ahead of the rest again. China is now to the US what the US was to Britain in the late 19th century. Its rapid economic growth has taken its share of global economic output from 2.3 percent in 1980 to 16.5 percent in 2014, making it 0.6 percentage points larger than the US economy. Millions of Chinese citizens have been lifted out of poverty in the process. American prosperity remains higher than Chinese prosperity – according to the Prosperity Index, it is some 32 percent higher. But this lead has narrowed from 35 percent over the last decade. At this rate of convergence, China’s prosperity will match that of the US in another decade. Perhaps the comparison is unfair: China is an emerging economy and is seeing gains in welfare that Americans enjoyed a long time ago. But if we look to a fellow OECD member – Germany, for example – the story is the same. 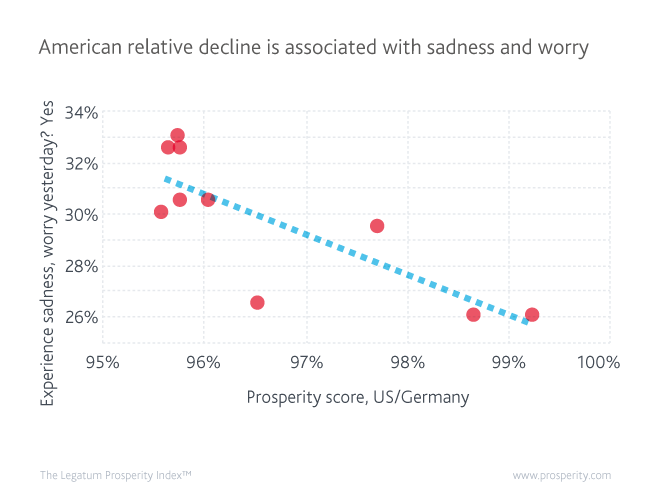 America’s prosperity score stood at 99 percent of Germany’s in 2007, but had dropped to 96 percent by 2016. Absolute decline, relative decline or stagnation? We can think of a country being in decline in one more way: when it is stagnant. In this sense, the US has been in decline since household income peaked in 1999. 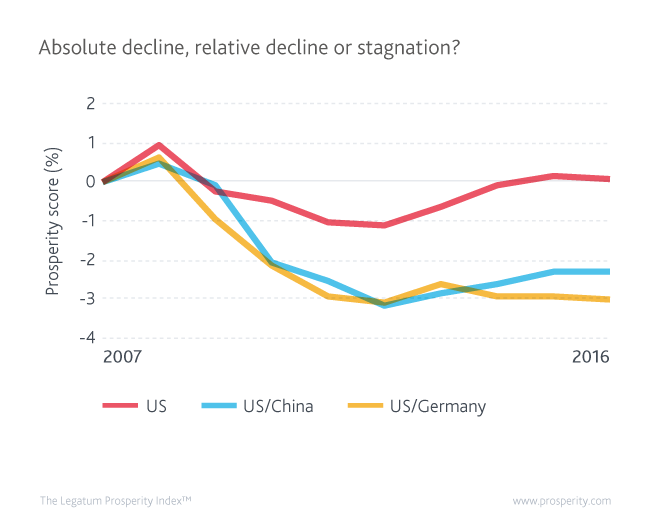 More broadly, prosperity has also been stagnant for the past decade. The American prosperity score is at the same level now as it was in 2007. While American prosperity is not in free fall, as he claims, it is stagnant and losing ground to advanced and emerging countries alike. There is some truth in Trump’s “American decline” narrative. While American prosperity is not in free fall, as he claims, it is stagnant and losing ground to advanced and emerging countries alike. Researchers continue to debate the causes of this decline, but there has been no consensus yet, which complicates the search for policy fixes. There is at least consensus on the effects of Trump’s tweet-sized policies: build a wall along the Mexican border, restrict Muslim immigration, make NATO allies pay for protection, start a trade war with China. Each one will harm the components of American prosperity. Restricting and deporting immigrants, to the extent Trump proposes, requires a police state with constant identity checks, home raids, and neighbours spying on one another; it corrodes Americans’ Personal Freedom and Social Capital. Trump’s proposed treatment of NATO would damage American and global Safety & Security, while his anti-trade plans would knock America off first place in Business Environment. 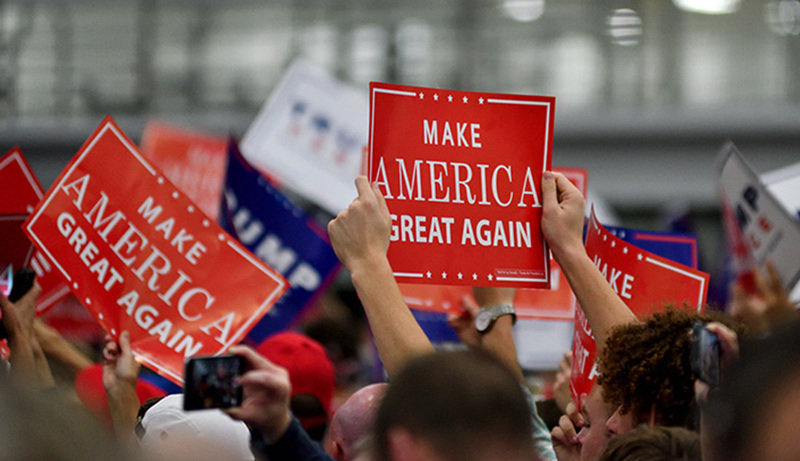 Make America Great Again: In the context of the United States’ prosperity stagnation and relative decline, the appeal of the Trump brand of populism to those who feel left behind by globalisation is not unsurprising. The Prosperity Index has pointed to decline in the US long before Trump emerged as a voice for discontent. It is not the level of prosperity but the trend which people experience most acutely. Our wellbeing is amplified during periods of growing prosperity and is diminished, at a greater rate, during periods of declining or stagnant prosperity. The experience of decline causes anxiety among voters and so broadens the appeal of populists like Trump who, by embodying radical change, promise relief from stagnation. Research by the Nobel Prize-winning economist Daniel Kahneman has shown that we are more sensitive to losses than we are to equivalent gains. A loss can be absolute, like that experienced by the ancient Romans, or it can be relative, like that experienced by Americans today. Although the US remains one of the world’s most prosperous countries, its stagnant prosperity over the past decade has caused widespread discontent. The experience of decline causes anxiety among voters and so broadens the appeal of populists like Trump who, by embodying radical change, promise relief from stagnation. But what populism, whether represented by Trump or by others, offers instead of relative decline is absolute decline: an America where people have lower Personal Freedom and weaker Social Capital; an America that is unsafe and closed to global commerce. Apart from Personal Freedom, which the Index shows to have improved recently, these are the pillars of prosperity that are most in need of improvement. 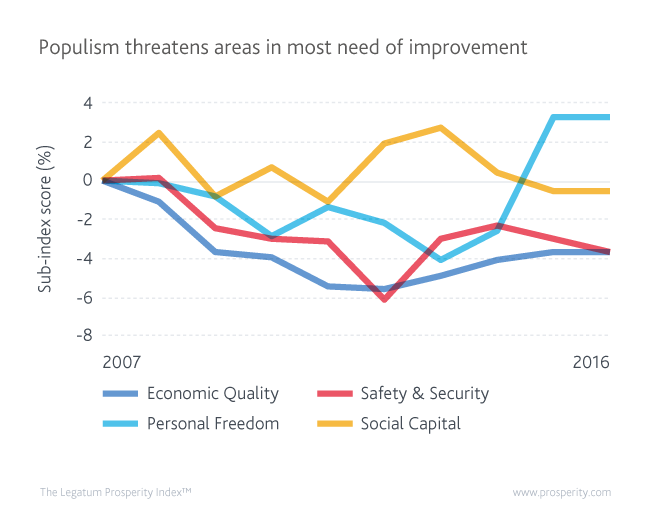 American Social Capital, Safety & Security, and Economic Quality are at a lower level now than they were a decade ago. Now, it is not Joe Biden’s world leaders who are betting against America, but American leaders themselves.